Train, Equip and Send Christians for Missions. Create Christian Mission Training Center, a parasol for all activities in agreement with MCGN's vision. The Center will operate under the auspices of MCGN with its own Board of Directors. MCGN-Mizoram Coordinator, appointed by MCGN International President, will be the Executive Director who takes care of the Center day-to-day operation. Prepare Science Text Books for schools and colleges with specific inclusion of origin by creation. A proposal for the text books preparation project will be submitted to the appropriate Mizoram government agency. Publish a monthly Newsletter for distribution to members. Translate or prepare and publish good Books. Books will be selected based on its relevance to MCGN's vision. 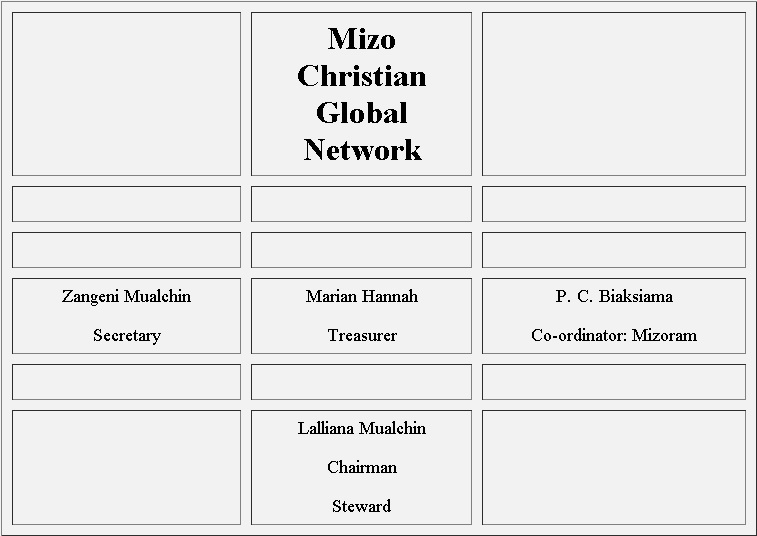 MCGN Vision is to equip or to build up Christians in Mizoram and the surrounding region for God's Kingdom. Establish Christian Mission Training Center. Equipping the Saints for the work of the ministry in the Hindu, Muslim and Buddhist communities. Institute for Evangelical & Biblical Theology. The priority is to construct a multi-purpose building for Christian Mission training operations center. Think Tank for Christian Mission Strategies in India. Project Development Headquarters for MCGN. Seminar, Workshop and Retreat Center. Mizoram Resource Center for Agriculture, Forest &	Education. Networking with other Institutes, for Christian Business, Investment & Entrepreneurship. Waiting on funds of approximately $30,000 for the foundation and structure of the center. Organization Chart is structured on biblical servant-hood concept.